Honoring the legacy of Mary Booth Steward, M.D. 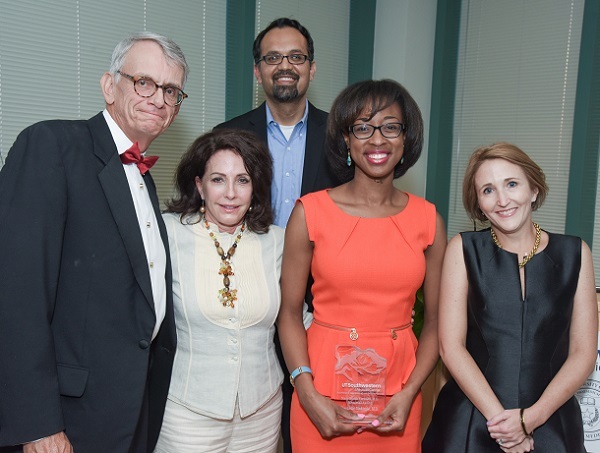 Dr. Rachelle Makinde (second from right) is honored as the recipient of the first Mary Booth Steward, M.D. Memorial Award. Congratulating her are (from left), Dr. Charles Whitten, Chair of the Department of Anesthesiology and Pain Management; Caroline Cammack; Dr. Ravi Bhoja; and Dr. Catherine Barden. The brilliant career of Mary Booth Steward, M.D., will be recognized through the establishment of the Mary Booth Steward, M.D. Resident Training Fund to support the education of residents in the Department of Anesthesiology and Pain Management at UT Medical Center. The endowed fund has been established with a $20,000 donation made through the Whit Cammack Foundation by Caroline Cammack, Executive Director, and daughter of Dr. Steward. In addition, the Mary Booth Steward, M.D. Memorial Award will be presented annually to one graduating anesthesiology resident who demonstrates compassion, professionalism, and humanism—all of the intangible, humanistic qualities embodied by Dr. Steward. Others would describe her mother as the most caring, loving individual who ever touched their lives, said Ms. Cammack. Dr. Steward was extremely devoted to her parents, who came from humble beginnings and instilled a wonderful work ethic in her and her three siblings. 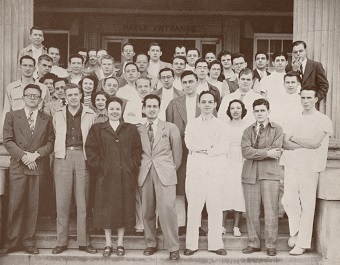 Mary Steward (second row, far right in white) is pictured in 1945 with her Southwestern Medical College freshman class. Image provided by the UT Southwestern archives. Mary Booth graduated from nursing school and worked as a nurse for a short time, but soon set her sights on medical school. At the time, her older brother had already gone to medical school and her younger brother would soon follow in his tracks. She decided to embark on a career in medicine when it was not commonplace for women to work. After graduating from Southwestern Medical College in 1949, Dr. Steward practiced pediatrics for a short time, but returned to complete an anesthesiology residency. She would become the first female resident in anesthesia at Parkland Hospital and UT Southwestern Medical Center, the first female anesthesiologist in Taylor County, and one of the first female physicians in Abilene. Her anesthesiology career at Hendrick Memorial Hospital in Abilene spanned 33 years. Dr. Charles Whitten, Chair, and Dr. Ravi Bhoja, Associate Professor, both from the Department of Anesthesiology and Pain Management, are grateful for this gift that will keep Dr. Steward’s legacy alive at UT Southwestern. Drs. 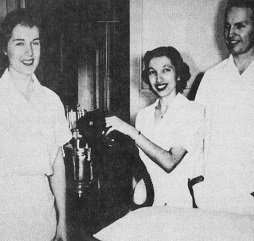 Nellie R. Luhn (left) and Mary Steward, both residents in anesthesiology, pose with Dr. Pepper Jenkins (right), circa 1950. Image provided by the UT Southwestern archives. Ms. Cammack is grateful for the comfort and support she received from her mother throughout her life, especially after losing her only child, Whit, in 2007 at the age of 18. She lost her father shortly thereafter in December 2012, followed by the death of Dr. Steward in December 2014. Caroline Cammack created the Whit Cammack Foundation in memory of her beloved son, Whit.